You can do more. Be your customer’s preferred choice before you’ve even met. Escape the exhaustion of trying to drive more business using the same tired methods. Inbound marketing is a proven system that’s ripped from the pages of history and given a new name. Do you have a system that predictably delivers triple-digit gains in new business opportunities? Unless what you’re selling is both illegal and addictive, nobody wants to be in your sales funnel. They don’t want to fill out your “contact us” form. They don’t want a cold-call from your sales team. Before you answer, think of a recent purchase you made between $500 and $20,000. What did you do leading up to the purchase? It doesn’t matter if it’s B2B or B2C. The behavior is the same. If you’re like most people, you researched and self-educated before you talked to sales. You probably researched online. 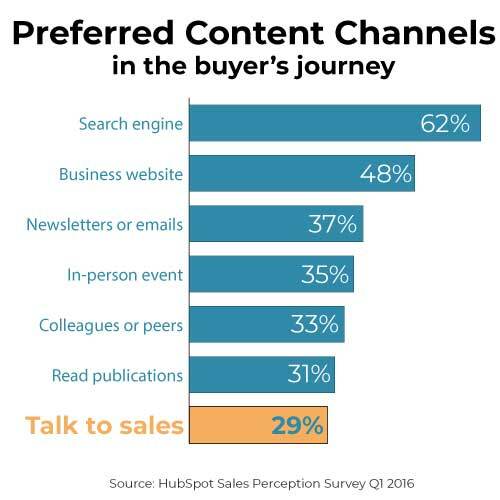 According to the Harvard Business Review, 60% of the buyer’s journey is self-education. The Harvard Business Review reported that 60% of the buyer’s journey is self-education. A 2016 study said 57% of buyers were less dependent on sales than they were 2-3 years prior. What do you think it’s like now? Fewer than 1-in-3 people want to talk to your sales team when they’re self-educating. Do you have a strategy to engage them early in their journey? The same study showed that buyers prefer the following methods of education more than talking to sales. Who meet’s your customers’ self-education needs more? You or your competition? Most businesses ignore the online sales funnel. They want the marketing team to drive potential customers to the website. Then they want the potential customers to purchase or call from the website. This works if you are in a commodity business that competes on price alone. But what do your metrics show? Does your website produce a predictable source of leads for your business? The ideal sales funnel that every business wishes were true – but isn’t. You don’t need to invent a new system. Legendary leaders like Jack Welch and Steve Jobs “stole great ideas with pride.” Those “stolen” ideas transformed their businesses and transformed the world. Inbound marketing is your opportunity to steal a great idea from history. Tell me what your customer is doing before they need you and I’ll flood you with new opportunities. It’s the difference between anticipation and reaction. Wayne Gretzky anticipated, and it made him a hockey legend. Michael Dell anticipated what people were doing before buying a newspaper subscription. Then he made more money during summer break than his teacher made all year by selling newspaper subscriptions. The Michelin Guide is a 100-year-old content marketing strategy to sell tires. The Michelin brothers anticipated and intercepted their customer before they needed tires. Have you heard of the Michelin Guide? Chefs and hotels will do anything for favorable ratings in the Michelin Guide. But what do chefs & hotels have to do with tires? Michelin launched a content strategy in 1900 that vaulted them to leadership. The piece of content was the Michelin Guide. They gave it to chauffeurs who wanted to ingratiate themselves to their employer. The chauffeurs drove their employers to wonderful restaurants and inns. That wore down the tires. When they needed new tires, they called the Michelin Tire Company. Michelin already had the relationship and won the business for new tires. Do you see how this works? Inbound leads are 60% of the cost of outbound leads. Your inbound closing rate is much higher than your outbound closing rate. Are you getting triple-digit gains? Our inbound clients achieve triple-digit gains in new leads for their business. But we don’t stop there. We enroll the raw leads in a marketing automation system to develop the leads until they are ready to buy. We believe our work is meaningless until it changes your revenue. AFAM does private wealth management for high net-worth individuals. Typically, they are managing a half million dollars or more of the individual’s life savings. The challenge is finding total strangers and convincing them to write a $500,000 check. Not of someone else’s money, but of their own money. That is a lot of trust. We deployed Inbound Marketing Services for AFAM. Then they achieved their best sales year in 14 years. Build a customer value journey that converts someone from a total stranger to a customer. (Then to a promoter). Continually add value at each step. The types of value you provide evolve as you move through each of the four main groups in the journey. Inbound is a proven framework for converting strangers to customers, and then to promoters. Attract – This brings strangers into your universe and engages them with your brand. Convert – Our first conversion goal is to capture their contact information. You exchange something valuable to them for something valuable to you. You exchange content for contact information. Close – You continue to use content to nurture and mature the lead. Then you take them through an ascension series until they become a customer. Delight – Once they’re a customer, you want to convert them to a promotor. This should be designed and systematized to make it predictable. Think of a relationship in “real life.” You know it’s too forward to walk up to a total stranger and ask them to marry you. Things that don’t work in “real life” don’t work online either. You need to nurture the relationship to bring it to maturity. Dig deeper and you’ll find the details of progressive engagement. Just like real life, each step brings more intimate knowledge and more commitment. Does it surprise you that this method brings triple-digit growth? Start with a plan for success. Map your entire customer value journey. You can get triple-digit growth in your marketing. Start with an assessment to identify gaps in your customer value journey. Those gaps are opportunities to drive more qualified leads to your sales team. Purchase an assessment for $250 to identify gaps that are keeping you from your potential. Of course, $250 doesn’t cover our time and effort for the assessment. We’d rather do this for free. But our time is valuable, so we focus on companies that are serious about change. $250 helps us separate the serious from the non-serious. If you don’t find the assessment valuable to your business, we’ll refund 100% of your money. No fine print. No mumbo-jumbo. Guaranteed. If you decide to move forward with the next step, we’ll apply the $250 to the cost of your next service. You’ve got nothing to lose and everything to gain. You’ve seen the methodology. It makes sense. You’ve seen the results; triple-digit gains with one company achieving their best sales year in 14 years. You’ve got the money-back guarantee. Did we miss any of your concerns? Yes, you do have something to lose. There are costs to inaction. Is the internet going away? Can you assume your competitors aren’t already working on a similar strategy? Will it get easier to compete as more companies deploy Inbound strategies? We also don’t represent a company that’s in direct competition with an existing client. Do you want to reserve your spot and see triple-digit gains? Or do you want to watch others strengthen their digital marketing? Is it Time to Abandon Facebook?